We’ve been married for 32 years. Perhaps our family life has not been exactly typical for North Americans—shortly after our wedding Myroslaw was ordained a priest in the Ukrainian Catholic Church. We were both students when our study trajectory was interrupted. Our bishop assigned Myroslaw to a parish many hours away from our home and universities. Within the year our first daughter was born prematurely because of a terrible car accident. Her subsequent struggle for life set us on our family odyssey. Over the next few years we had two more daughters, and even with the demands of parish life, we both completed doctoral studies, in theology and English respectively. While Myroslaw pursued work in the Church and academia, Maria has remained the primary care-giver for our youngest daughter. Both of our elder girls live abroad. 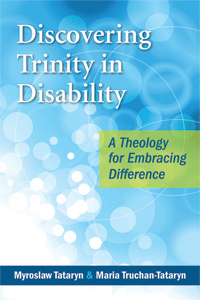 In Discovering Trinity and Disability you share heart-wrenching stories of how your daughters were excluded simply because of their differences. How do you see God working in the midst of these challenges? If we recognize God as love, then we see God’s work wherever we love: this is surely the true miracle of life. Despite pain and suffering, love inspires hope. While our society, our community and even our extended family may reject us, we see God in the light of our daughters’ eyes. We see God in the awe that strangers express when they observe the bond between the three sisters. We see God in the revived strength of previously isolated individuals who feel the welcoming embrace of a community who genuinely wants them. God dwells in all of us, but perhaps is most evident when we choose to acknowledge that our humanity is a vehicle for God’s work. You write that “The Beatitudes establish a Kingdom normalized not by exclusion and power, but by inclusion and service.” Can you tell us more about that? The word “kingdom” unequivocally evokes notions of power, territory, control, and sovereign rule. We often admire those who successfully manage or have membership in private kingdoms, like financial enterprises or social establishments that provide status. Kingdoms of territory or ideology are carved and protected by the exclusion of non-adherents, be it through war or legal sanction. Christ’s Sermon on the Mount turns our aspirations of power and might upside down. God’s kingdom does not destroy the Other. The kingdom of Heaven is not ruled by those with powerful armies, allies, or funds. The kingdom described by Jesus enfolds, nurtures, and loves; it has no margins that exclude or exile the unwanted. The kingdom of God enfolds all who seek goodness. Here culturally constructed categories like gender, race, status, ability, sexuality, nationality have no currency. Your book offers many thoughtful ideas for embracing and including those who are so often marginalized by perceived disabilities. What are two things you believe people can do to work for this in their own communities? The first step to an inclusive community is a necessary confrontation with the cultural attitudes of discomfort towards the difference we characterize as disability. We cannot begin to tear down walls of exclusion until we begin to acknowledge the invisible barriers that distort our reception of others. We need to be aware of our reactions to images of disability. How do they make us feel? Pity? Fear? Guilt? Generosity? Can we relate to that image of a person? Recognizing stereotypes is a step towards dispelling them and the prejudicial attitudes they generate. Another important step is towards inclusive community is simply invitation: invitation that creates relationship. Whether formally as a parish initiative or individually as a personal one, try to approach someone whom you don’t know in your community. Get together for a coffee at a café, have dinner together, or even just chat after service on Sunday. Get to know people you would not normally, regardless of whether or not you see a disability. Then, open up a conversation about how we feel wanted and needed in our community. How can we improve? Are there people in our other circles who may need an invitation to join our faith community? Do we need to improve our physical environment to be more accessible to more people? Do we need ramps, elevators, large print, space for movement or something completely different to help make a person or family know that we want, and need, them to be with us? What resources are available for people who want to create inclusive environments in their churches? The most important resource is people: parish members and leaders who want to enter into conversation to discover what barriers exist to prevent people with disabilities from attending church. The Canadian Association for Community Living suggests 10 steps to inclusive communities.